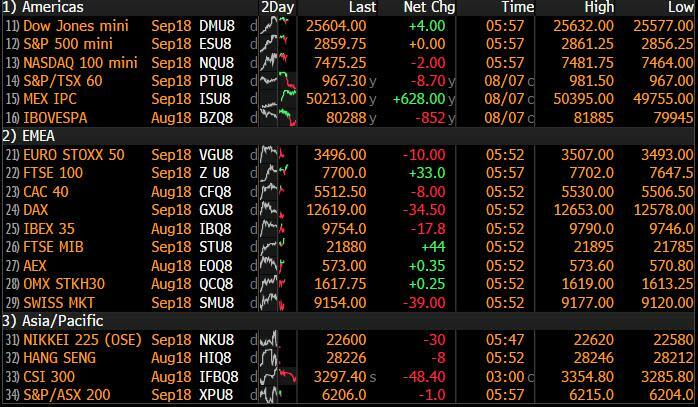 In another "summer lulled" subdued session with low volumes, Asian markets were mixed while European stocks were broadly lower Wednesday, following several key earnings misses, while a new round of US tariffs on China imports affecting $16BN in goods pushed back the trade war into the open, even as the S&P 500 is just 14 points, or 0.5% away from making new all time highs as the VIX hit a 7 month low. The result is a mixed market snapshot, with US futures flat, but coiled to surge higher after the open. In notable macro moves, the USDJPY broke below 111, with the EURJPY accelerating below 129 although no specific news drivers were cited for JPY bid. The greenback initially weakens in response to the move in the yen before rallying to day’s high, especially against emerging markets and the Turkish lira, which lost all recent gains. In global equities, the MSCI’s index of world stocks was marginally higher. "Everyone is just focusing on U.S. earnings... and feeling the U.S. market will remain robust despite trade uncertainties, and that’s the main driver right now," that is how Market Securities' Christophe Barraud summarized the current decoupling sentiment. He cautioned that fall could bring a reality check in the form of slower U.S. growth indicators, Italian politics, Britain’s Brexit negotiations with the European Union, U.S. mid-term elections and - above all - the risk of trade war escalation. And to be sure, earnings support is less evident elsewhere, after a raft of weak results pushed European shares to slide lower: health-care and insurance companies dropped on the Stoxx Europe 600 Index, offsetting gains in technology, while raw materials firms lost ground after Glencore missed its earnings forecast. Asia’s benchmarks gave up some earlier advances, as shares in China notched many of the bigger declines, with the Shanghai Composite sliding 1.3% amid renewed trade war fears. Trade fears were tempered somewhat by signs Beijing is unveiling further measures to support growth, such as increasing infrastructure spending and tweaking its monetary policy stance. Adding to previous moves to ease pressure on the yuan, the People’s Bank of China urged some lenders to prevent any “herd behavior” and momentum-chasing moves in the currency market, according to people familiar with the matter. Even so, the offshore Yuan dropped to session lows of 6.8450 erasing much of yesterday's gains as trade war fears returned. Trump's trade war was once again front and center, after the U.S. said it will begin imposing 25% duties on an additional $16 billion in Chinese imports in two weeks, the second time Washington slapped tariffs on Chinese goods in about a month. Even so, exports from the second-biggest economy grew faster than expected in July and imports surged, signaling the trade war has yet to make much of a dent on shipments as it has on equities and showing that both domestic and international demand continue to rise despite the uncertainty of trade relations with the U.S.
As reported late last night, China's exports growth edged up to +12.2% yoy in July, slightly above consensus. Meanwhile, imports surged to 27.3% yoy in July, well above consensus. Exports: +12.2% yoy in July (consensus: +10.0%). June: +11.2% yoy. Month-over-month exports growth: +0.2% in July, vs. +0.5% mom sa non-annualized in June. Imports: +27.3% yoy in July (consensus: +16.5%). June: +14.1% yoy. Month-over-month imports growth: +5.6% in July, vs. -2.9% mom sa non-annualized in June. S&P500 futures were unchanged, with all eyes still on Tesla shares after Elon Musk suggested taking the company private, without providing any actual details or revealing his mysterious source of "secured funding." Meanwhile, emerging market shares advanced and their currencies held steady even as the Turkey’s lira erased most of Tuesday’s gains, as investors said there’s no easy way to rescue its financial markets. In FX, the dollar was steady, as the Bloomberg Dollar Spot Index erased an early decline of 0.2% even as the yen rallied. Demand for Japan’s currency livened up an otherwise quiet Asian session. The pound dropped a fifth day against the greenback, sliding to an 11 month low, while it also dropped to the weakest level against the euro in almost nine months as markets gauge the risk to the U.K. leaving the EU with no deal on future ties. Market players said they were seeing increasing moves by investors to hedge sterling risks: “A lot of companies can’t wait until the (Brexit) outcome is clear... Many of them are trying to hedge against a drop in sterling,” Barraud of Market Securities said. The euro failed to sustain a short-squeeze rally and yuan gains proved short-lived. Treasury yields were steady, with the 10Y trading flat a 2.97% ahead of the biggest-ever 10-year note auction, while euro-area bonds were modestly higher. On oil markets, Brent futures held firm around $75 a barrel as U.S. sanctions on Iranian goods went into effect, intensifying concerns of looming crude supply shortages. In an escalating trade war, the U.S. said it will begin imposing 25% duties on an additional USD16b in Chinese imports in two weeks. Customs will begin collecting the duties on 279 product lines, down from 284 items on the initial list, as of Aug. 23. The new list covers products ranging from motorcycles to steam turbines and railway cars. China’s exports grew faster than expected, while imports surged, showing both domestic and international demand continue to rise despite the uncertainty of trade relations with the U.S.
Asian stock markets were mostly positive as they sustained the momentum from the US where the majors eked modest gains with the DJIA led by strength in energy and industrials, while the S&P 500 inched closer towards all-time highs. ASX 200 (+0.3%) was led higher by miners and surprisingly financials despite weaker earnings from Australia’s largest lender CBA and scandalridden AMP. Elsewhere, Nikkei 225 (-0.1%) was initially supported throughout most the day by earnings and a weaker currency but then pared gains in late trade, while Hang Seng (+0.4%) and Shanghai Comp. (-1.3%) were mixed with underperformance in the mainland amid increased trade tensions after the US finalized the 2nd tranche of tariffs in which it will impose 25% tariffs on USD 16bln of Chinese goods from August 23rd. Finally, 10yr JGBs were higher for most the session despite as prices rebounded from this week’s pressure and support near the 150.00 level, while the BoJ were also in the market for nearly JPY 1tln of government bonds concentrated in 1yr-10yr maturities. China NDRC said they will use monetary policy including targeted RRR reductions to support debt-to-equity swaps, while it added it will require banks to be stricter in limiting corporate debt and restrict high leverage firms from borrowing too much. European equites have largely opened the day mixed, as the focus remains on large cap earnings. Uninspiring earnings from both Munich Re (-3.5%) and E.ON (-1.8%) have hit the DAX, which alongside the SMI are both in the red. The healthcare sector is the underperforming sector after Novo Nordisk reported a miss on both EBIT and revenue expectations. Earnings for AEX heavyweights ABN AMRO (+3.3%) and Ahold Delhaize (-2.0%) were also released, with the Ahold missing on net profit expectations. In commodities, the oil market is currently uneventful with WTI consolidating around its 100DMA of USD 74.53/BBL as news flow has been light for the fossil fuel after yesterday’s larger than expected draw in crude stockpiles in the weekly API report alongside a surprise build in gasoline. China's President Xi has instructed Chinese state oil companies to lift production, according to CNOOC. In the metals sector gold (-0.1%) is up slightly, currently trading around the USD 1215/OZ level. London copper is also up on the day, and has set the scene for base metals, with all of nickel (+1.5%), zinc (+0.5%), lead (+2.6%) and aluminium (+0.2%) up on an improved risk sentiment. Looking at the day ahead, in the US we get the latest weekly MBA mortgage applications data. Away from the data, the Fed's Barkin is scheduled to speak while CVS Health and Glencore are due to report earnings. Tomorrow will mark the eleven-year anniversary of when BNP Paribas froze withdrawals from three of its investment funds linked to US subprime mortgages. Money markets started to seize up shortly after which led to huge and coordinated central bank action, subsequently leading to the extraordinary period of central bank activity that we now know today. Amazingly the S&P 500 actually rose +2.42%, +0.62% and +1.41% in the three days leading up to August 9th 2007. Talk about being lured into a false sense of security. It then fell -2.96% on August 9th and subsequently lost another -54% over the course of about two years until the lows in September 2009. So this day eleven years ago really was the calm before the storm for markets. However, one of the great ironies about financial markets in the period since is that returns in major global financial assets have been incredibly healthy notwithstanding a few outliers. For example the S&P 500 has delivered a total return of +148.8% while Euro HY and US HY have returned +102.8% and +98.6% respectively. Other equity markets like the Hang Seng (+85.0%), FTSE 100 (+86.4%), DAX (+69.7%), Nikkei (+61.3%) and Stoxx 600 (+53.6%) have also rewarded investors handsomely. Treasuries have also returned +46.0% and Bunds +59.6%. Indeed of the 39 assets in our sample, 30 have seen a positive total return. Some of the exceptions to this include the Greek Athex (-79.8%), European Banks (-60.4%), CRB Commodity Index (-37.5%), Portugal General (-22.4%) and Shanghai Comp (-26.3%). So while the general conclusion is one of very positive total returns, not every class has benefited from huge intervention and general asset price inflation. It’s perhaps apt that with this big anniversary date in mind, the S&P 500 last night continued its upward march for a fourth day in succession, closing up +0.28% and so taking it to within 0.50% of the all-time closing high made back in January. Indeed on another quiet day for newsflow there was no stopping risk assets once again. The DOW and NASDAQ also ended +0.50% and +0.31% respectively while in Europe the Stoxx 600 earlier finished +0.47%. 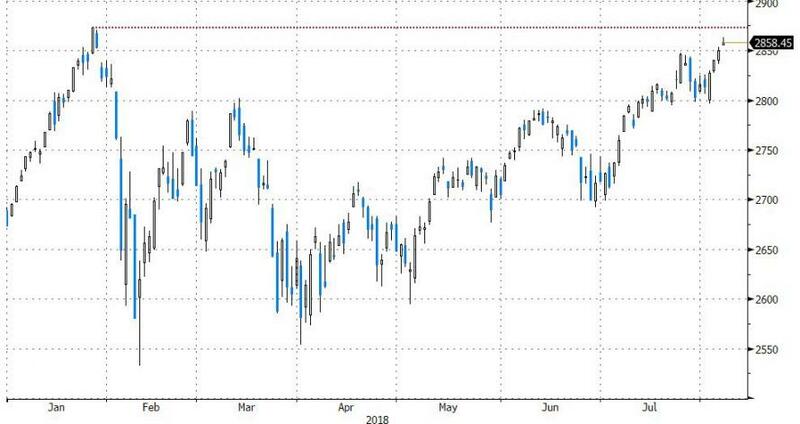 Moves yesterday also helped a number of European markets climb back into positive territory for the year again, joining the S&P 500 (+6.91%) and NASDAQ (+14.20%), with the likes of the Stoxx 600 (+0.34%) and FTSE 100 (+0.40%) now back onside and the FTSE MIB back to flat for the year. The DAX (-2.09%) and IBEX (-2.70%) are two markets which continue to languish in the red however. Meanwhile the VIX nudged down to 10.93 yesterday and to the lowest since mid-January, while bond markets were for the most part a little weaker with 10y Treasures and Bunds ending +3.4bps and +1.9bps higher respectively. The most notable move for bonds yesterday actually came in Turkey where 10y yields tipped above 20% and to a new all-time high but then recovered later on, in part as Bloomberg reported that Turkey’s deputy foreign minister was leading a delegate of officials to hold their first meeting with the US in Washington sometime today. The positive momentum for risk has continued into Asia this morning however the exception is China once again. While the Nikkei (+0.49%), Hang Seng (+0.46%) and Kospi (+0.27%) are all higher, the Shanghai Comp and CSI 300 are -0.32% and -0.55% respectively following confirmation by the US Trade Representative Office last night that Trump’s administration is to begin imposing 25% tariffs on an additional $16bn of Chinese goods from August 23rd. Despite that the CNY has strengthened an albeit modest +0.17% following a meeting between the PBoC and Chinese Banks yesterday which concluded with the PBoC urging banks to prevent “herd behaviour” in the FX markets. According to Bloomberg the PBoC told the Banks that it has the necessary tools to stabilize the market while also keeping the CNY flexible and allowing it to move in both directions. China’s July trade stats were also out this morning with the main takeaway being an unexpected jump in exports (+12.2% vs. +10.0% expected; +11.2% previously). 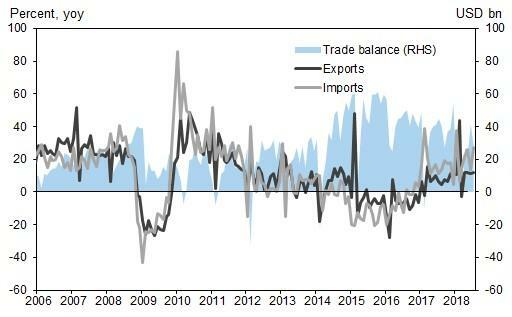 Imports also rose which resulted in a smaller surplus however the jump in exports should help to alleviate some of the trade war concerns. The August data is likely to be a lot more significant however given the timing of tariffs. On an otherwise quiet day for markets then one story which did stand out was Tesla where the founder Elon Musk signalled his intention to take the company to private ownership with the tweet “Am considering taking Tesla private at $420. Funding secured”. If we used the takeout price of $420 per share (a roughly 23% premium to Monday’s close), this would value the company at an enterprise value of around $83bn. With the debt needed to fund, this would be the largest leveraged buyout ever, exceeding the prior $48bn deal for Texas power utility company Energy Future Holdings back in 2007. Tesla’s share price jumped 11% last night which corresponds to an increase in market cap for the company of $6.4bn. In other words that tweet from Musk was worth around $667m per word in additional value for the company. Quite incredible. Moving on. A quick mention that this morning our House View team have published their latest infographic summarising the four central bank meetings that we’ve had in the last couple of weeks. The graphic includes a summary of the key takeaways and DB’s expectations going forward, as well as a link to each of our economists’ detailed summaries. Click on the following link to access it here. In other news, it was another quiet day for economic data yesterday. In the US, the June JOLTS survey indicated the number of job openings was broadly steady mom and just beneath the recent high at 6,662 (vs. 6,625 expected). Notably the quits rate was also steady at its cyclical high of 2.3% for the fourth straight month. Meanwhile after a strong print last month, the June consumer credit reading moderated to $10.2bn (vs. $15.0bn expected), leading to annual growth of 4.7% yoy. In Europe, Germany’s July industrial production reading fell more than expected at -0.9% mom (vs. -0.5% expected), although annual growth remains solid enough at +2.5% yoy (vs. +3.0% expected). Conversely Germany’s June trade surplus was stronger than expected at €21.8bn (vs. €20.9bn expected), with exports up +5.7% yoy and imports up +8.8% yoy. Back in the UK, the July Halifax house price index jumped +1.4% mom (vs. +0.2% expected) which lifted annual growth to +3.3% yoy on a three-month average basis. Elsewhere, with the spotlight back on Italy again with the budget developments it was perhaps reassuring that yesterday’s Target 2 net liabilities balance revealed a modest drop in July to €471.1bn after reaching a record high back in June (€480.9bn). Meanwhile the Bank of Italy also noted in its latest Economic Bulletin in mid-July that Target 2 debt had been stable since mid-June. Looking at the day ahead, in Europe, the only data release is France's July Bank of France industry sentiment index, while in the US we get the latest weekly MBA mortgage applications data. Away from the data, the Fed's Barkin is scheduled to speak while CVS Health and Glencore are due to report earnings.